A Scorpio-Gemini match can be both fascinating and frustrating. Gemini has a much more light-hearted approach to love and friendship than Scorpio (for the most part). Gemini does not seem as committed, or at least they do not display their need for commitment with as much vigor as Scorpio. Scorpio is usually a very serious and faithful partner, while Gemini can be freedom-loving, inconsistent, and evasive. The different approaches in the way Scorpio and Gemini shows love and affection can be alarming and confusing. Positively speaking, Gemini adds a lot of enthusiasm, liveliness, good humor and fun into the relationship. Gemini is likely to think of unique and exciting date ideas and they can always bring up a topic of conversation which is interesting and stimulating for Scorpio. 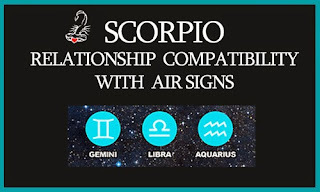 However, Scorpio may sometimes not feel emotionally secure with Gemini, because they seem to have two natures: sometimes Gemini is very affectionate and loving, and other times Gemini seems indifferent and cold. Scorpio never knows what they’re going to get with Gemini, and this can be deeply unsettling for Scorpio. Scorpio fears that Gemini will not always be there for them. Scorpio likes to know what happens next, and when they enter a relationship they are in it for the long-haul. Gemini, on the other hand, tends to live in the present moment and takes things one step at a time, without much concern for thinking too far in the future. In fact, if Gemini feels pressured to commit before they are ready to, they will feel the need to run away from the relationship. If Gemini is given the freedom and independence they so deeply crave, then Gemini is more likely to be satisfied and remain in the partnership. Luckily, Scorpio enjoys their solitude because they are very independent themselves. Therefore, Scorpio may not always feel the need to be tied to the hip with their partner. They can be a bit shy when it comes to love, but if Gemini is able to break down their barriers using their sharp humor and witty conversation skills, scorpio will eventually open up to them — but only if they gain and keep their trust and does not play mind games with them. Scorpio is a highly dependable lover, and Gemini should not take their loyalty for granted. This relationship works best if you both work on your own interests and projects, while uniting when you both need each other’s support. You can make a formidable team if you find a balance between sharing your passions and also respecting each other’s need for seclusion. The key to overcoming the potential challenges in Gemini-Scorpio pairing is to learn to love and appreciate each other’s differences. Scorpio and Gemini are attracted to what makes each other so different. They should embrace their eccentricities rather than change them. 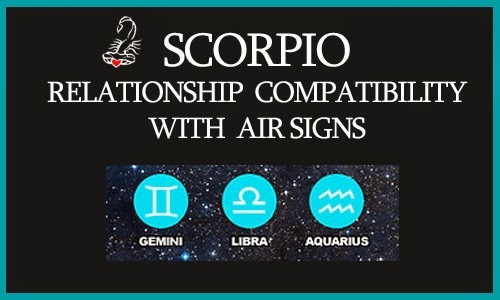 Scorpio is a Fixed Water sign, and Aquarius is a Fixed Air sign. When two Fixed signs come together, it is a very crazy ride! Scorpio and Aquarius have character traits which are not traditionally compatible, but that just makes their relationship all the more interesting. Their connection with each other is very unpredictable and has a tendency to go to extremes. Scorpio in particular is much more emotional and subjective than Aquarius is. Scorpio feels everything on a very profound and intense level, and is known for their tremendous passion. Aquarius is much more passive and indifferent than Scorpio. Aquarius tends to be very mellow and does not like to spend too much time wallowing in their feelings. Air signs tend to be intellectually-oriented rather than emotionally-oriented. A Scorpio and Aquarius relationship is like a case of opposites attracting (although these two are not actually opposites in the zodiac). Aquarius loves coming up with abstract, unorthodox, futuristic and progressive ideas. An Aquarian mind is constantly bustling with exciting new concepts, and Aquarius can work independently on a project if they think it will benefit society or if they have a unique vision that others have not yet thought of. Scorpio is also quite the intellectual thinker, but Scorpio tends to follow intuition more than reason. For this reason, Aquarius may not always understand where Scorpio is coming from when they say that they “feel” something is not right. Aquarius would rather have concrete answers on which facts point to something being wrong. Aquarius’ natural instinct is to be cerebral and rational, so it will take some getting used to Scorpio’s emotiveness. There are times when Scorpio may feel like they are investing more into the relationship than they is getting in return. That is not necessarily the case — Aquarius simply expresses affection for Scorpio in a much less overt way. When Scorpio commits to someone, they are all-in 110%. No one else really matters as much as their partner. As for Aquarius, it will always be very essential for them to have independence and exert freedom. Aquarius does not like the feeling of being tied down or possessed. Being an Air sign, they want to be able to roam around as they please. If Scorpio is able to loosen her grip and possessiveness, Aquarius can prove their loyalty to Scorpio by creating by their side and supporting their endeavors. A potential downfall of a Scorpio/Aquarius relationship is that they are both extremely stubborn. Neither sign is endowed with the gift of flexibility, particularly Scorpio. This means that when they get in debates or arguments, neither wants to back down. They both want the final word and they do not like to admit defeat. Although this can add a lot of excitement to their partnership, it can also be detrimental if they take things too far and become overly pushy with each other. Both of Aquarius and Scorpio have big egos and big prides, but knowing when to be the bigger person and apologize is key to maintaining a healthy and long-lasting partnership. There are certain aspects of Scorpio’s personality which may grate on Aquarius’ nerves (how Scorpio always looks deeply into things, is naturally suspicious, and can be possessive and controlling), and some aspects of Aquarius’ personality that grates on Scorpio’s nerves (does not display emotions, can be flirtatious or overly social with others, is not always consistent in action), there is a reason these two met and are experiencing life together. If they focus on what brings them together rather than what threatens to pull them apart, their love will flourish and strengthen. These two can learn so much more about the world when as a couple than when they are apart. Their union is enriching and illuminating, and it is worth the occasional struggles.